The provisional lists which was pasted at the entrance of INEC office, in Owerri, had sixty seven candidates of several political parties. 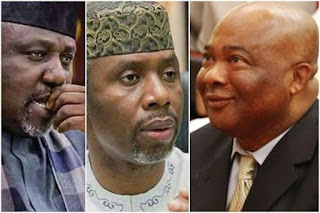 The development may not be unconnected with the court case over who becomes the authentic governorship candidate of Imo APC. Top among the names were the candidates of the Peoples Democratic Party, PDP, Emeka Ihedioha, and the All Progressives Grand Alliance, APGA, Senator Ifeanyi Araraume. Recall, the National Working Committee, NWC, under Adams Oshiomole, said the leadership of the party had submitted the name of Senator Hope Uzodimma as the authentic guber candidate of the party in the state. But Okorocha, who was struggling to install his son-in-law, Uche Nwosu, as his successor has disagreed with the stand of Oshiomole, arguing that Nwosu should be described as the flag-bearer of the party. THE EASTERN TELEGRAPH. Powered by Blogger.